Rogers is now offering a Samsung Galaxy Tab 10.1 with a new interesting plan. 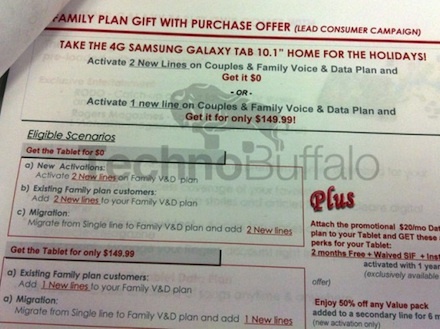 According to the photo of a document given below, starting November 8th (2011), when you activate two new lines on couples plan or family voice and data plan, you will be able to get a Galaxy Tab 10.1 for free. To sweeten up the deal even more, the network provider will be giving you two months of free service and will waive that activation fee as well. Pretty generous if you ask me. For those who are interested in activating just one new line, you will have to shell out 150 dollars. If you are really into this deal, you might have to hurry up as Rogers will be offering this deal to first 30,000 customers.